The team in Uganda is made up of over 100 part-time volunteering members. Out of these 100 members on our books, we have four regularly active executive members who run the organisation on a day-to-day basis. Together, the team are donating their time and skills - alongside their jobs - to improve the health and well being of many Ugandans by running the Mwenya Uganda projects. The Ugandan team are at the heart of Mwenya Uganda, their extremely hard work, dedication and innovative ideas are what drive Mwenya Uganda forward. Jhon is the beating heart of Mwenya Uganda. Mwenya was a distant dream of Jhon's until 2010, when it started to become a reality. Jhon spent the first two years of his time with Mwenya balancing his enormous amounts of work volunteering to get Mwenya up and running, with his full time job working as the only dentist and manager of a private dental clinic. In January 2013, the clinic where Jhon worked was kindly offered to Mwenya by Sabano, Jhon's ex-boss. Thanks to a generous donation from Bristol Alumni Foundation, Jhon was able to continue working in this clinic, but this time he's working for Mwenya! Mwenya Uganda started as Jhon's idea. He was one person. There are now over 120 Mwenya members in Uganda. He’s motivated hundreds of people to believe that they really can help others in their own country. Jhon grew up in traditional bush house that he built himself, with no electricity. Thankfully, he was sponsored through school. He was the only pupil at his school to be head boy twice! It was Jhon's dream to become a dentist so he worked night shifts at a petrol station to fund his dentistry studies during the day. He is now a fully qualified senior dentist and hopes one day to go back to university and become a lecturer. Jhon’s energy for Mwenya is limitless. He is well known for refusing to sleep until all Mwenya Uganda work has been completed for the day! Through Mwenya Uganda, he aims to use his skills to help people who are particularly vulnerable to poverty, for example, orphans, the elderly and disabled people. He feels like his work with Mwenya has significantly improved his knowledge of the real issues in oral health in rural areas of Uganda. 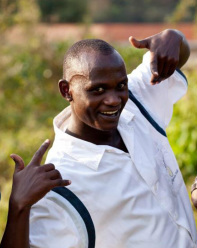 Jhon loves working with other professionals from around the world who have a common goal of improving health, education and social issues in Uganda. 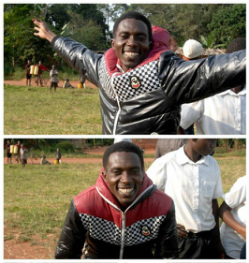 Jhon’s sheer determination and unending enthusiasm is what drives Mwenya Uganda. He says, Mwenya Uganda “is making a great difference since it is made up of professionals in all sectors”. If Jhon is the beating heart of Mwenya, Tina is Mwenya's set of lungs! Tina has recently graduated in Development Studies from Msamizi Training Institute of Social Development. She is now working full time in the Mwenya Uganda office in Mpigi. She’s dedicating her time as the office’s secretary so that she can help people who are in need of Mwenya Uganda’s services. Tina has also completed counseling and guiding training which qualifies her to counsel orphans, people with HIV and those with family issues. 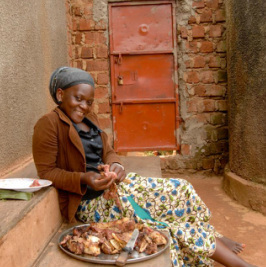 Tina was motivated to start volunteering for Mwenya Uganda as she has seen many people living in difficult situations. She is particularly motivated by helping orphans and vulnerable children, so was appointed the director of our Orphan and Vulnerable Children project (OVC). Tina is known for her beautiful smile, constant ideas and optimism for Mwenya. She has taken on the role of mother to Mwenya's 12 Orphans and Vulnerable Children, as she loves helping them learn to read and develop new skills every Sunday when the children visit Tina in the office. She feels extremely lucky to have found Mwenya so soon after graduating and her dedication to helping other people coupled with her organisation and attention to details meant that she was soon promoted to working as Mwenya's Office Secretary. Mstapher works in his family’s hairdressing salon which is located next door to Mwenya Uganda’s office in Mpigi. He was inspired to become a member of Mwenya after he saw the volunteers in high spirits after an elderly Outreach day. Mstapher’s involvement with Mwenya has taught him many things. It has highlighted to him the terrible situations that some people live in and how he and his fellow members and friends can help. He enjoys developing his leadership and organisational skills through his work with Mwenya Uganda, something that he would not have had a chance to do, if it were not for his involvement with the NGO. Mstapher feels privileged to be a member of Team Uganda. He says Mwenya is different thanks to its transparency of everything done in the organisation, especially the use of funds. Mstapher believes that Mwenya volunteers have an enormous sense of self-courage which helps Mwenya grow through volunteers' common vision and drive. Mstapher's entrepreneurial mind has been one of the keys in starting Mwenya's social enterprise projects. Fred was so pleased to join Mwenya Uganda because he had previously been a herbal medicine advisor in another project in Masindi. Tragically the Director of this project died at the age of 24. Fred has always wanted to continue her legacy. He says that Mwenya Uganda is so special thanks to “a committed founder (Jhon) who helps people with all his heart, no discrimination, 100% transparency and high quality services." He loves seeing people happier and healthier thanks to the combined efforts of the Mwenya Uganda team. 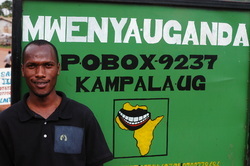 Fred owns a shop in Mpigi town and he is also the manager of Lwaboojjo Fortune Hostel. Using his training in medicinal plants and homeopathy, Fred can provide rural community members with herbal alternatives to drugs which are often difficult to come by and extremely expensive for people living in rural areas. Fred has also been a crucial part of the Mushroom social enterprise, getting up at 4am everyday to take the mushrooms to local market in Kampala, since the elderly farmers in the community were not able to travel such distances in the morning. Despite his regular early mornings, Fred is always smiling and full of energy for Mwenya's projects.